Brian Luce is the Professor of Flute at the University of Arizona and a Yamaha Performing Artist. Dr. Luce has performed as principal flute of the Champaign-Urbana, Midland-Odessa, and Johnstown symphony orchestras and has performed with the Dallas Chamber Orchestra, Dallas Bach Society, Dallas Wind Symphony, Abilene Philharmonic, Keystone Wind Ensemble, and the Tucson Chamber Orchestra. As a soloist, he has performed throughout the U.S., Europe, Korea, Japan, and China and has performed concertos with orchestras in the U.S. and the Republic of Korea. He has been featured at music festivals sponsored by the National Flute Association, British Flute Society, Shanghai International Exposition, Soka International Harp Festival, Texas Flute Society, Florida Flute Association, Mid-South Flute Society, Las Vegas Flute Club, Albuquerque Flute Association, Flute Society of St. Louis, Arizona Flute Society, and Tucson Flute Club. His performances have been broadcast throughout the U.S. and his recordings are recommended references by music education associations including the ABRSM. Acclaimed as “an authoritative soloist,” his Albany Records SACD, Music of the Superpowers: Sputnik, Spies, and the Space Race, has been lauded by The American Record Guide: “This release should be of particular interest for the less known, seldom recorded Denisov and Smirnova, though everything on it is enjoyable from beginning to end. 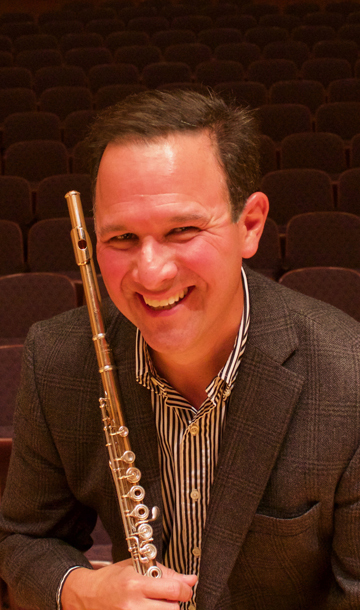 Brian Luce plays with flair and intelligence…” He has also made the premiere recording of Anthony Plog's Concerto for Flute and Wind Ensemble with the University of Arizona Wind Ensemble. His release with Carrol McLaughlin, Allume, includes numerous premiere recordings of original works and transcriptions for flute and harp. He has recorded for the Naxos, Albany, Toccata Classics, and Citadel labels. He has taught at universities in Illinois, Texas, and Pennsylvania and tutored numerous young flutists across the nation. Brian is a prizewinner of the National Flute Association Young Artist Competition, Myrna Brown Young Artist Competition, Mid-South Young Artist Competition, and Kingsville International Young Artist Competition. His principal teachers include Mary Karen Clardy, Kathleen Chastain, Jacob Berg, and David Etienne. As an Arizona native and avid outdoorsman, Brian enjoys trekking afield the beautiful alpine regions of the state with his family. He coaches youth baseball and softball for Little League and serves as an executive board member. If unable to audition during the regular dates, personal auditions may be arranged directly through Dr. Luce to occur throughout the year on campus and when he performs and teaches on tour. Apply to the School of Music through the Acceptd online application service.